PROGRESSIVES need to cut the posturing over a currently unattainable (and in any event already hollowed out version of the) “public option.”…. Criticizing what is now attainable is the real defeatism, Adam Green! Conservatives are hammering wavering moderate Dems; use your resources to run moderate ads against private insurers in their districts. Praise the President’s plan and help him get the votes. Same for MoveOn. ….As for PRO-CHOICE versus PRO-LIFE advocates, give us all a break from your extremist posturings….”FEMINISTS” who are pushing on abortion-funding limits rather than supporting American women need to examine their consciences….CATHOLIC PRO-LIFE DEMOCRATS also need to get a grip on core values. Do they — or the U.S. Catholic Bishops — really want to be responsible for scuttling access to health care for millions? Read the whole thing. Its language is blunt and, in places, insulting. But sometimes that’s what it takes. The current bill isn’t perfect, but the combination of community rating at the national level with an individual mandate is likely to be the beginning of the end for private health insurance as we know it. Medicaid expansion and insurance subsidies will provide access to healthcare for 30 million more Americans. Caps on out-of-pocket expenses will prevent countless medical bankruptcies. The cost containment measures — including, yes, the hated excise tax — may be modest, but they’re the most substantial effort on this front in decades. And most important, this bill, for the first time ever, officially commits the United States to the proposition that every legal resident should have healthcare coverage. That’s a huge change both culturally and politically. And what are the holdups? The absence of a watered-down public option that would have had a modest impact at best? But look: If we pass the current bill, we’ll have a meaningful public option before the decade is out. If we don’t, we won’t. The possibility of public funds being used for abortions? Go read Tim Noah on this. For better or worse, it’s just not a legitimate issue. The restrictions in the Senate bill are pretty strong. Lack of public funding for abortion? That’s just the reality of present-day America. It was never going to be any other way. And let’s be honest: the current legislative wording would have no more than a tiny real-world impact on abortion funding anyway. It’s available now in some states via Medicaid, and that won’t change. It’s covered under private healthcare plans, and that won’t change either. It’s not funded by any other federal mechanism, and that won’t change. Someday, hopefully, this will all change, but that’s going to take a lot more work on public opinion. In the meantime, a bill that helps millions of poor and working class women get healthcare they couldn’t otherwise afford far outweighs the minuscule effect it would have on access to abortion. It is, finally, time to step up. 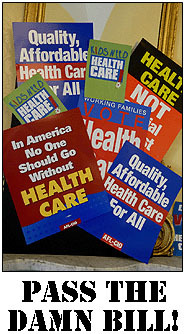 Like it or not, Scott Brown’s victory in Massachussetts drew a very strong boundary around healthcare reform. We can either pass what we have or pass nothing at all. Passing what we have (with a few small tweaks via reconciliation) will help millions, put us on a path toward ever more serious healthcare reform, and give progressives their biggest victory in decades. But only if progressives stop moping and get behind it. So if you’re one of the mopers, knock it off! And if your congressman is one of the mopers, pick up the phone and complain. Tell ’em you want to pass the bill. Now.